The person who gave me this could not tell me what it is. I only suspect that it is an orchid. I would like to identify it so that i can coax in to bloom, which it hasn't yet. In this photo, i have just removed it from the course soil that it was in. You're right, this is an orchid! The thick white roots are a dead giveaway; the white part is an outer layer of dead cells called velamen. 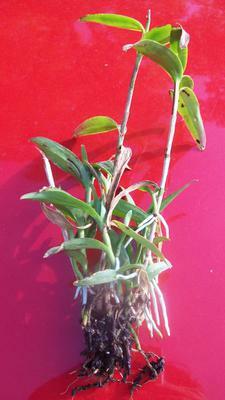 It's a bit hard to tell what kind of orchid it is since it's not blooming right now; my best guesses are Dendrobium or even more likely (because the leaves look stiff and thickened) Epidendrum. Both kinds have long canes from the base with leaves coming off the sides. Best of luck with your new plant!